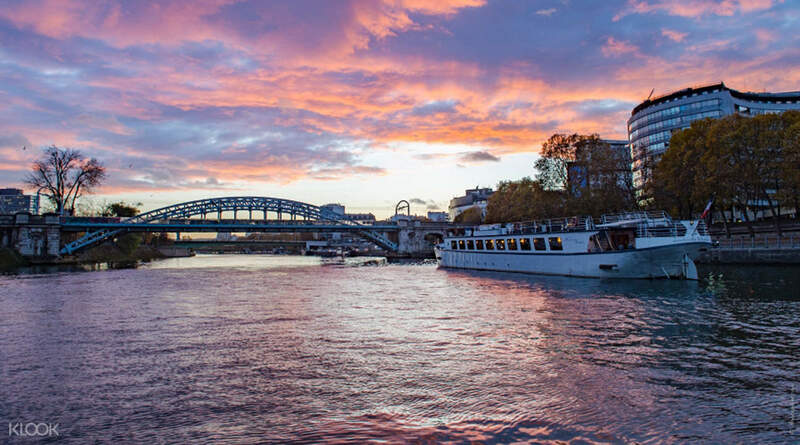 Get a unique experience of Paris by taking a cruise along the Seine, while enjoying traditional French cuisine. Board the La Marina boat, located on Quai Anatole France, just steps from the Musée d'Orsay. 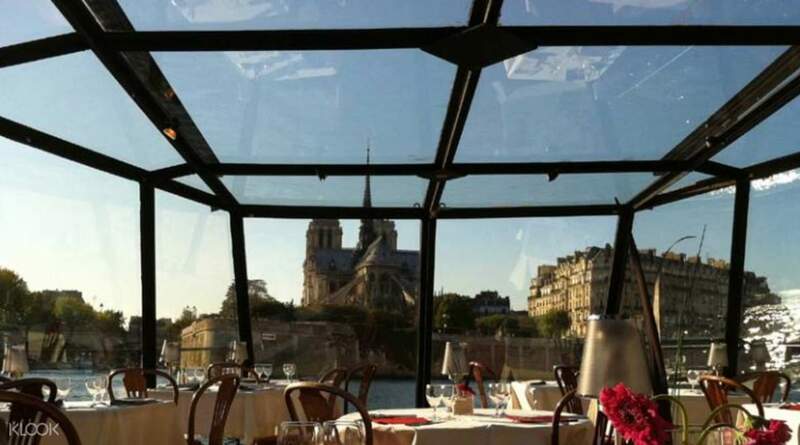 You'll be welcomed aboard the boat-restaurant with an unforgettable lunch or dinner cruise along the Seine in Paris. Select your choice of menu using only the freshest ingredients, prepared by experienced chefs. 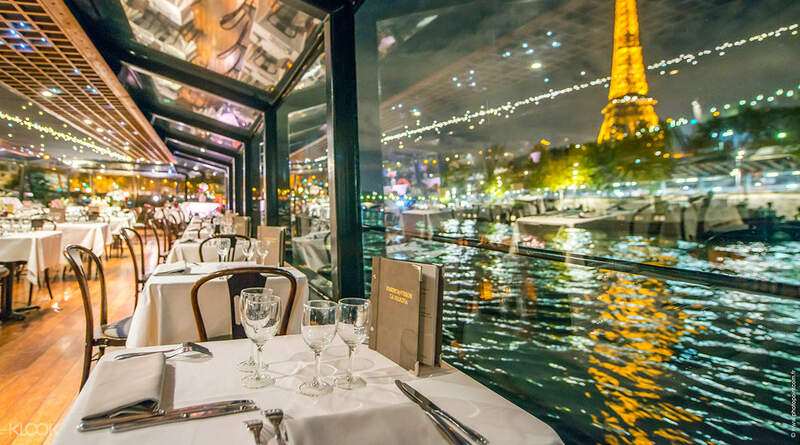 Through the large windows of La Marina, you will be able to admire the Seine and the famous bridges of Paris, such as the splendid Pont Alexandre III and the romantic Pont des Arts. Among the great landmarks located along the banks, you will have a breathtaking view of the Île de la Cité with its Notre-Dame Cathedral and the Conciergerie, the Musée d'Orsay and the Louvre. You can admire the Grand Palais, one of the most iconic monuments of Paris, which hosts many exhibitions, and also see le Palais Bourbon, which is home to the Assemblée Nationale. At night, gaze on a magnificent view of the illuminated monuments along the Seine including, of course, the magnificent Eiffel Tower lit up at night. 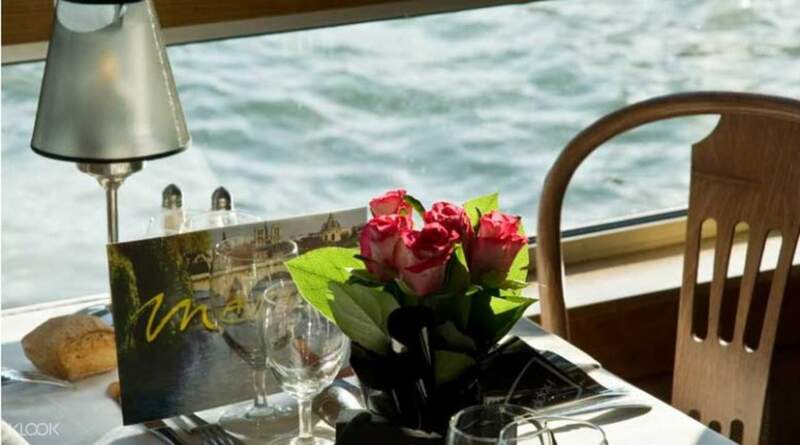 In the boat's cozy and intimate surroundings, enjoy a romantic or relaxed dinner in a warm atmosphere, savoring a traditional French meal prepared with seasonal produce, and drinks provided depending on the package. 2:00pm/8:00pm/11:15pm return to "le Musée d’Orsay"
By RER: Ligne C to station "Musée d’Orsay"
By Taxi: to "Port de Solferino"
It was an insanely beautiful boat cruise with dinner, drinks and wonderful sights. Thing is I went with a buddy but it’s definitely made for couples. It was an insanely beautiful boat cruise with dinner, drinks and wonderful sights. Thing is I went with a buddy but it’s definitely made for couples. The whole cruise was amazing. Food is great. The staffs were very friendly. The whole cruise was amazing. Food is great. The staffs were very friendly. Super nice view... Love the taste of the food... the only thing lacking with this is the live music inside the cruise so that it will be more romantic and more worth it. Super nice view... Love the taste of the food... the only thing lacking with this is the live music inside the cruise so that it will be more romantic and more worth it. A very pleasant experience! Good view and good food! I would recommend this to my friends. A very pleasant experience! Good view and good food! I would recommend this to my friends. One huge thing.. we showed up to the address listed on the voucher and could not the right boat anywhere. We walked back up to the street, tried a few doors, then just happen to look waaaaay down the way and see a mass of people. Apparently, it was about 1/2 a mile down and we almost didn’t find it. I think the address needs to change to get you further down the street to the right location. We tried calling the Klook number but no answer. However, once we found the boat We really enjoyed our experience. Food was good (not spectacular), but good. Well, meat was over cooked and doused in gravy so i wasn’t a fan. BUT the waitress was fun, the music was nice, and you get really close to the Eiffel Tower! Great for photos. Also, purchasing things from the klook app and using them here has been HASSLE FREE!!!! We have really loved using it!! One huge thing.. we showed up to the address listed on the voucher and could not the right boat anywhere. We walked back up to the street, tried a few doors, then just happen to look waaaaay down the way and see a mass of people. Apparently, it was about 1/2 a mile down and we almost didn’t find it. I think the address needs to change to get you further down the street to the right location. We tried calling the Klook number but no answer. However, once we found the boat We really enjoyed our experience. Food was good (not spectacular), but good. Well, meat was over cooked and doused in gravy so i wasn’t a fan. BUT the waitress was fun, the music was nice, and you get really close to the Eiffel Tower! Great for photos. Also, purchasing things from the klook app and using them here has been HASSLE FREE!!!! We have really loved using it!! Amazing view and ambience!!! Worth it! :) have to ask around to find the location but it’s not hard to find. Amazing view and ambience!!! Worth it! :) have to ask around to find the location but it’s not hard to find. 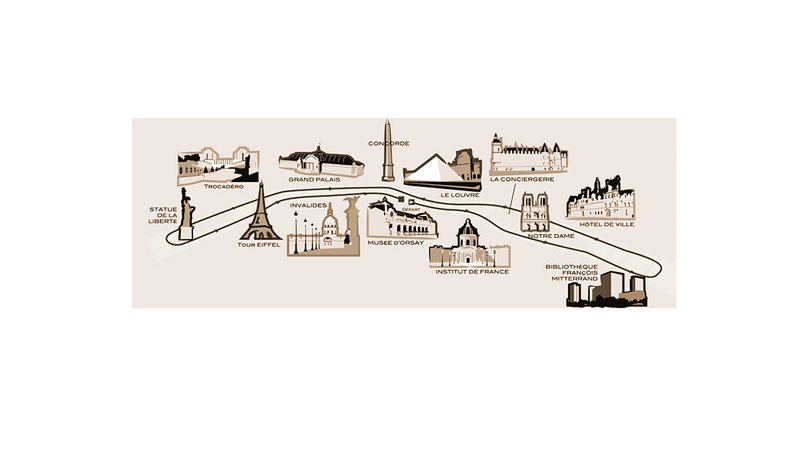 The location of the cruise is directly across the Musee Orsay by the river Seine. Just present the voucher to board the boat and you will be seated accordingly. We were seated by the window with a good view of the sights and landmark. The food is pretty good and the cruise is relaxing and a little romantic ... except the tables are arranged quite close to each other. Nevertheless, it is a good memorable experience and well recommended especially to couples. The location of the cruise is directly across the Musee Orsay by the river Seine. Just present the voucher to board the boat and you will be seated accordingly. We were seated by the window with a good view of the sights and landmark. The food is pretty good and the cruise is relaxing and a little romantic ... except the tables are arranged quite close to each other. 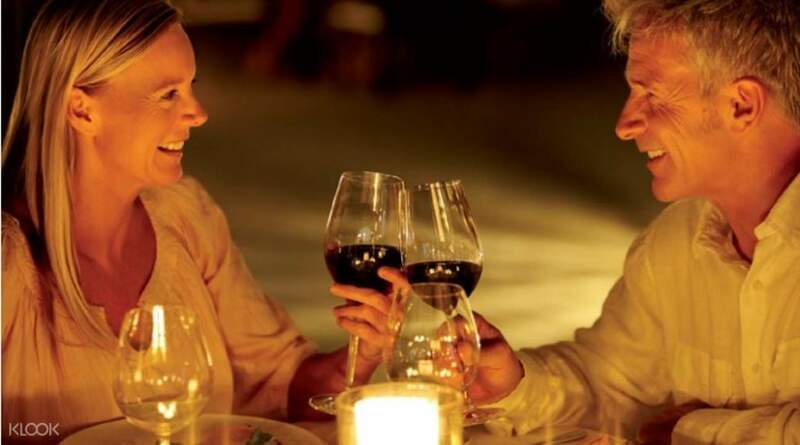 Nevertheless, it is a good memorable experience and well recommended especially to couples. Highly recommended river cruise dinner. It was a great experience and the food is delicious! Highly recommended river cruise dinner. It was a great experience and the food is delicious!